This volume (1) defines the specific-anticompetitive-intent, lessening-competition, distorting-competition, and exploitative-abuse tests of illegality promulgated by U.S. and/or E.U. 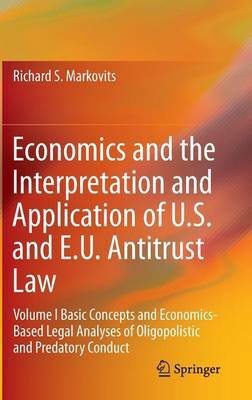 antitrust law, (2) compares the efficiency defenses promulgated by U.S. and E.U. antitrust law, (3) compares the conduct-coverage of the various U.S. and E.U. antitrust laws, (4) defines price competition and quality-or-variety-increasing-investment (QV-investment) competition and explains why they should be analyzed separately, (5) defines the components of individualized-pricing and across-the-board-pricing sellers' price minus marginal cost gaps and analyses each's determinants, (6) defines the determinants of the intensity of QV-investment competition and explains how they determine that intensity, (7) demonstrates that definitions of both classical and antitrust markets are inevitably arbitrary, not just at their periphery but comprehensively, (8) criticizes the various protocols for market definition recommended/used by scholars, the U.S. antitrust agencies, the European Commission, and U.S. and E.U. courts, (9) explains that a firm's economic (market) power or dominance depends on its power over both price and QV investment and demonstrates that, even if markets could be defined non-arbitrarily, a firm's economic power could not be predicted from its market share, (10) articulates a definition of "oligopolistic conduct" that some economists have implicitly used-conduct whose perpetrator-perceived ex ante profitability depended critically on the perpetrator's belief that its rivals' responses would be affected by their belief that it could react to their responses, distinguishes two types of such conduct-contrived and natural-by whether it entails anticompetitive threats and/or offers, explains why this distinction is critical under U.S. but not E.U. antitrust law, analyzes the profitability of each kind of oligopolistic conduct, examines these analyses' implications for each's antitrust legality, and criticizes related U.S. and E.U. case-law and doctrine and scholarly positions (e.g., on the evidence that establishes the illegal oligopolistic character of pricing), and (11) executes parallel analyses of predatory conduct--e.g., criticizes various arguments for the inevitable unprofitability of predatory pricing, the various tests that economists/U.S. courts advocate using/use to determine whether pricing is predatory, and two analyses by economists of the conditions under which QV investment and systems rivalry are predatory and examines the conditions under which production-process research, plant-modernization, and long-term full-requirements contracts are predatory.